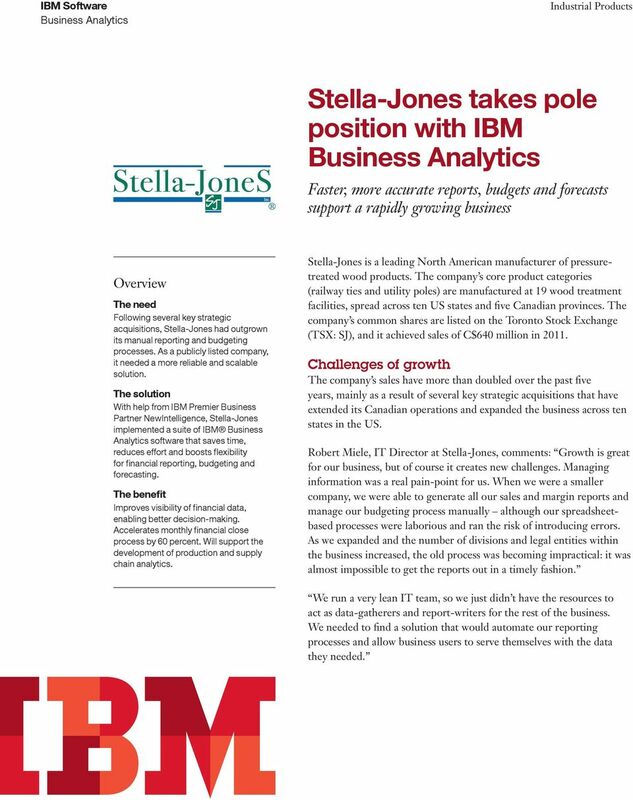 Download "Stella-Jones takes pole position with IBM Business Analytics"
1 Stella-Jones takes pole position with IBM Faster, more accurate reports, budgets and forecasts support a rapidly growing business Overview The need Following several key strategic acquisitions, Stella-Jones had outgrown its manual reporting and budgeting processes. As a publicly listed company, it needed a more reliable and scalable solution. 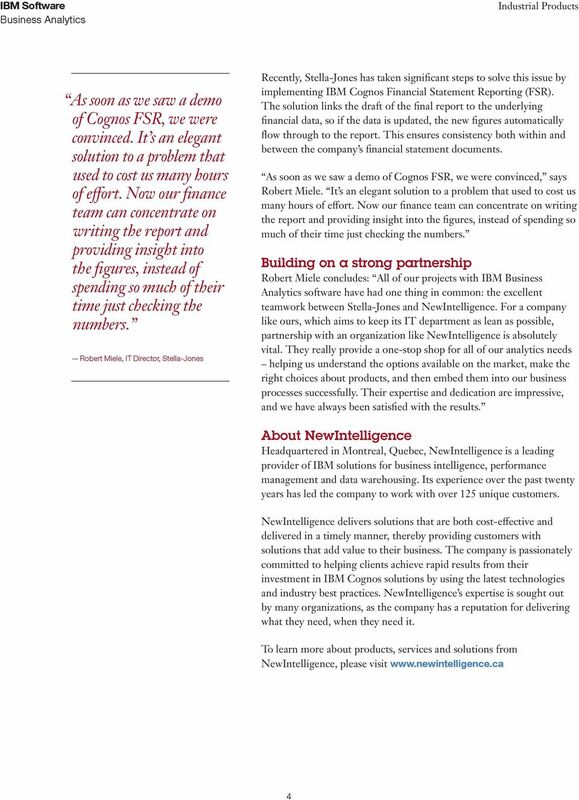 The solution With help from IBM Premier Business Partner NewIntelligence, Stella-Jones implemented a suite of IBM Business Analytics software that saves time, reduces effort and boosts flexibility for financial reporting, budgeting and forecasting. 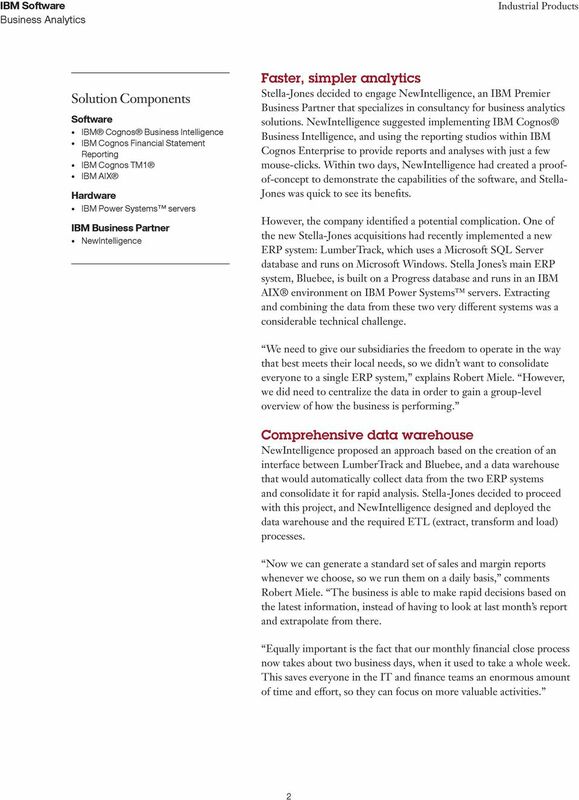 The benefit Improves visibility of financial data, enabling better decision-making. Accelerates monthly financial close process by 60 percent. 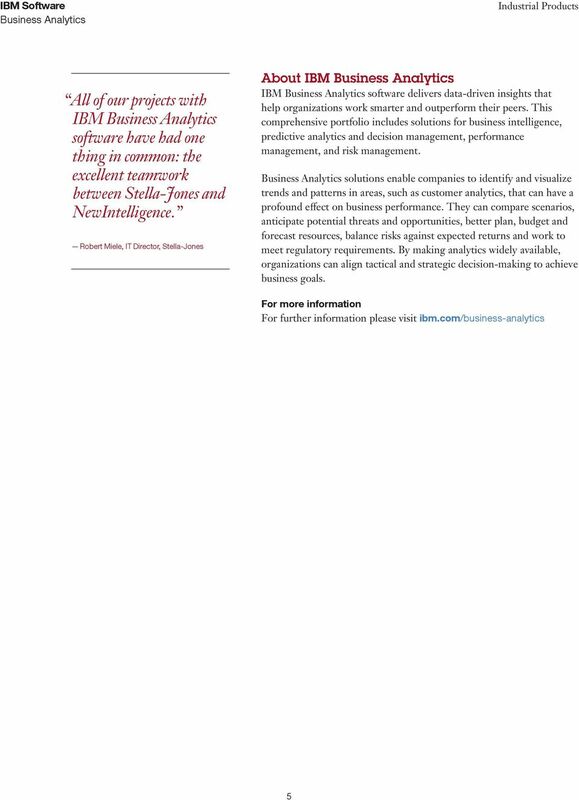 Will support the development of production and supply chain analytics. Stella-Jones is a leading North American manufacturer of pressuretreated wood products. The company s core product categories (railway ties and utility poles) are manufactured at 19 wood treatment facilities, spread across ten US states and five Canadian provinces. 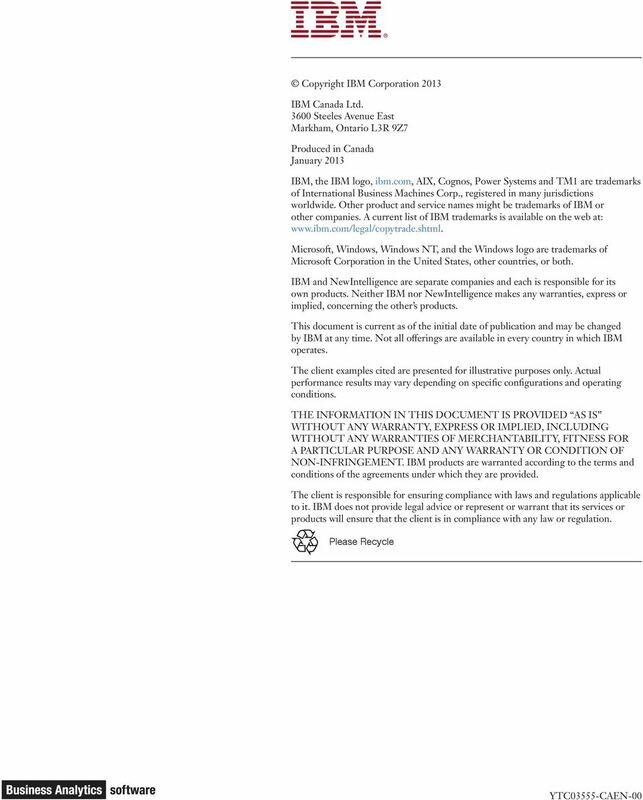 The company s common shares are listed on the Toronto Stock Exchange (TSX: SJ), and it achieved sales of C$640 million in Challenges of growth The company s sales have more than doubled over the past five years, mainly as a result of several key strategic acquisitions that have extended its Canadian operations and expanded the business across ten states in the US. Robert Miele, IT Director at Stella-Jones, comments: Growth is great for our business, but of course it creates new challenges. Managing information was a real pain-point for us. When we were a smaller company, we were able to generate all our sales and margin reports and manage our budgeting process manually although our spreadsheetbased processes were laborious and ran the risk of introducing errors. As we expanded and the number of divisions and legal entities within the business increased, the old process was becoming impractical: it was almost impossible to get the reports out in a timely fashion. We run a very lean IT team, so we just didn t have the resources to act as data-gatherers and report-writers for the rest of the business. 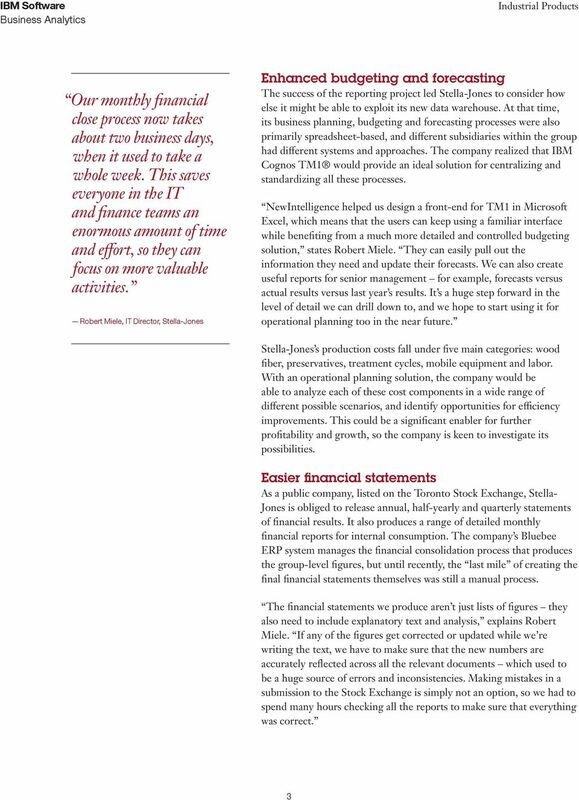 We needed to find a solution that would automate our reporting processes and allow business users to serve themselves with the data they needed. Assimil8 extends business analytics on demand to companies of all sizes About Assimil8 Assimil8 is a market leader in business analytics, financial reporting, planning & forecasting, and data warehousing.